This will be the first in a series of blog posts focused on Italy, as I am lucky enough to be spending 8 weeks on the Ligurian coast helping my girlfriend with her fascinating PhD research on the Ocean Sunfish, check it out (sunfishresearch.wordpress.com). Aside from acting as a research assistant (and general dogsbody haha) this trip will also provide me with plenty of time to photograph the varied landscapes, people and wildlife unique to this corner of Italy. Of course this will also provide plenty of opportunity to play with my recently acquired Fuji X-Pro 2 and an inherited old medium format film camera. This first week of my trip has been incredibly busy, with early starts and long days working with the local fishermen to pull their catch and bring it to port; however, I was able to take some time this weekend to explore the secret world of the Palazzi dei Rolli in Genoa. 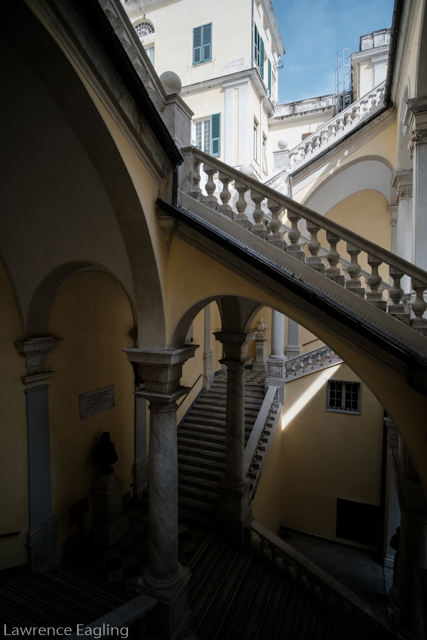 These old palaces are only open to the public on one or two weekends a year and provide an amazing behind-the-scenes insight into the old world glamour of the aristocracy in Genoa. 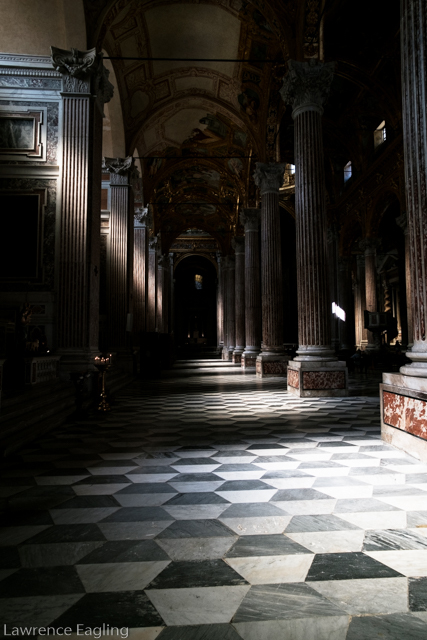 This provided a whole new insight into Genoa, so often seen as a hot, crowded port city, a maze of cobbled, winding streets and narrow alleys. The Palazzi dei Rolli are hidden behind huge plain doors (often studded iron or wood), where huge airy atriums yawn into open courtyards often filled with fruit trees or waterfalls. Leading off from the central courtyards, cold marble walls lead to extravagant rooms lined with silks and mirrors, gilded with gold paint and dripping with chandeliers. 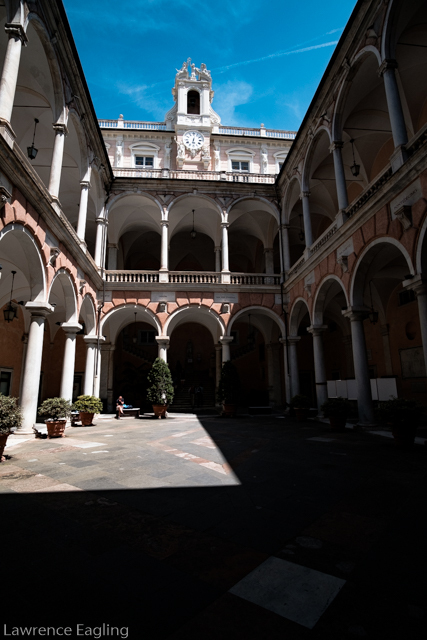 The combination of the strong Genoa sunlight, crystal chandeliers and large open windows provided lots of interesting opportunities for photography, creating areas of soft light inside contrasting with the harsh direct sunlight in the courtyards. Below is a selection of my favourite photos from the various Palazzi I visited and the streets of Genoa. All the photos were taken on the Fuji X-Pro2 with either the Fuji XF 23 mm or the Samyang 12 mm. If you want to find out more about the Palazzi dei Rolli check out the website here: www.rolliestradenuove.it. As always please get in touch via one of the following methods; email at lawrence@eaglingphotography.co.uk, Instagram @lawrence_eagling or twitter @LawrenceEagling.